The Shariah High Court here was today told that news of the divorce maintenance proceedings between Sarawak entrepreneur Mahmud Abu Bekir Taib and his former wife Shahnaz Abdul Majid had reached the far corners of London and Switzerland. Mahmud was asked by lawyers acting for Shahnaz to clarify the ‘global conspiracy’ cited in a news release issued by his public relations consulting firm in September last year. He told the court that news of his wealth and that of his father, Sarawak Governor Abdul Taib Mahmud had been exaggerated to the tune of billions. Testifying before Judge Muhamad Abdul Karim Wahab, Mahmud recounted that the politicised nature of the hearings had compelled him to engage a public relations consultancy firm. “What was supposed to be a private matter in ‘mutaah’ claims (conciliatory gift) before the courts was blown up into an international attack and slander to change the political landscape of Sarawak,” Mahmud had alleged in the news release issued last year. In the September 2014 news release, he had cited attacks by Clare Rewcastle-Brown’s Sarawak Report, who, he claimed, had picked up “every conceivable piece of malicious gossip and political scandal” to undermine his reputation and credibility as well as that of his father. As a result, Mahmud appointed GRA Communications Sdn Bhd to undertake media relation activities to ensure fair reporting of the on-going divorce maintenance proceedings which are presently before the Kuala Lumpur Shariah High Court as well as at the Kuala Lumpur Shariah Appeals Court. In an earlier media release Mahmud had claimed that his divorce had been hijacked by politicians and activists, and used to disseminate falsehoods under cover of the court. Those attacks, he said, had even reached the Swiss Parliament where MPs had demanded that Swiss banks reveal his accounts following Shahnaz’s revelation of 111 purported offshore bank accounts. Mahmud said that on September 24, 2013, following accusations by Swiss MP Carlo Sommaruga, the Swiss Attorney General informed both the Bruno Manser Fund and the public that no member of the Taib family held assets with Swiss banks after 1999. Prior to this date, two family members had held Swiss accounts. “The Canadian pair had fabricated astoundingly realistic-looking banking information that would lead one party to believe the other had millions of dollars in assets offshore,” he added. On 10 April 2013, the fraudsters Cullen Johnson and Elaine White were extradited to the US from a Turks and Caicos prison on charges of money laundering, tax evasion and several charges of fraud valued at over US$1m, he said, and have been indicted and jailed. He claimed further that it has been widely reported on the Internet that Sarawak Report political activist Clare Rewcastle-Brown had been in communication with Cullen Johnson. Johnson was also reported to have been in communication with his former wife and her team through a local private investigator. Shahnaz is claiming RM100 million for ‘mutaah’. 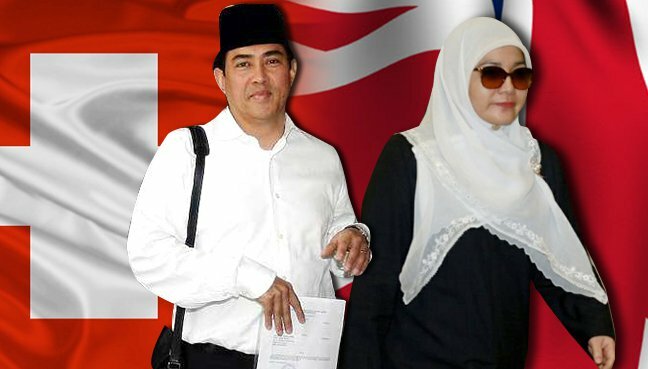 She has also claimed in excess of RM121 million for child maintenance for their son Raden Murya Abdul Taib Mahmud, including a terrace house in London (RM60 million), a residence in Bukit Tunku (RM10 million), two Aston Martins (RM5.5 million), medical insurance (RM5 million) and a private trust fund (RM40 million) to be held and managed by her. The multi million Ringgit demands have made it one of the most contentious divorce claims, one in which no precedent has been set in a Shariah court. Mahmud is defending the claims vigorously. Hearing continues on August 4. ← What if Eleanor Hawkins flashed her breasts in St Paul’s Cathedral?